I can't talk about how much I love this color, the green and orange sparkles. The dark burgundy. Everything. Can you see all of the sparkly goodness in this color? This just came out with the Metro Collection, and in my opinion the best color of this collection and one of the best colors China Glaze has come out with in a while. 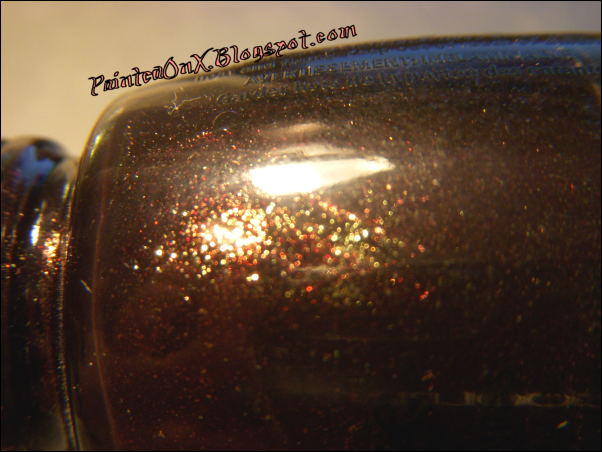 It's a dark burgundy base filled with green and orange glitter flecks. What this polish does in the light is amazing. In case you didn't know I'm deeply hurt how I was never lucky enough to get China Glazes - Fortune Teller. That polish is absolutely beautiful and Midtown Magic doesn't really compare to it in any way and Fortune Teller is still on the top of my wish list. I'm not saying that I've given up on my search for it but I kind of feel like I can relax a little on it now that I have this one. haha. I got a little picture happy with this color. I just wanted to properly show what this polish is and how awesome it looks. What do you think of this color? Is this your favorite from the new Metro Collection? So I know you're looking at these two thinking "why are you comparing these two, they are clearly different" yes, they are. Alone. applying another. This was released with the Katy Perry collection right when the big crackle fad started. Sally Hansen Xtreme Wear-Strobe Light is basically the same as Teenage Dream only MORE silver glitter and packed in a lighter pink,clearer base. Both pictures are 3 coats, 1 coat of Seche Vite. So you can see the difference of the two. Now check them both out over Color Clubs "Where's The Soiree?" Sorry the sun was gone and the flash really bounces off the glitter. I'll add another picture. I liked this combo so much I did all of my nails alternating each glitter. How do you think these two compare? So...It's only August 21 and I'm thinking about Halloween already. 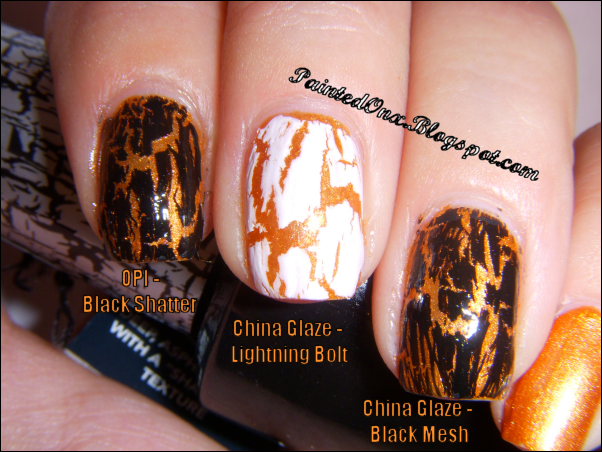 I just ordered the new China Glaze Halloween colors, I can't wait for them to get here!!! but still I need to relax and enjoy the rest of the summer. Pretty soon it's going to be snowing and I officially hate snow and after last years snow I'm ready to move south. 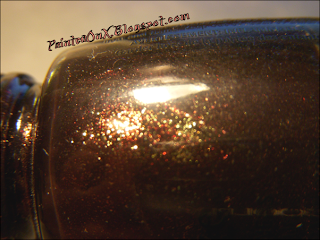 Anyway....Clubbing Til Sunrise is a Burnt orange with shimmer with a nice metallic like finish. It does make me think of the sunrise :) it applied very easily and covered well with 3 coats, however it is not a very forgiving finish for those with ridges in their nails but only real visible under certain lighting. Below: No base, 3 coats, no top coat. Again since I was thinking of Halloween I decided to try out some looks I might do in October. I tried 2 different black crackles. Which by the way seem pretty much the same other than formula goes, and white. I think I might try this alternating black and white. What do you think of the crackle over Clubbing Til Sunrise? My very first swatch post!!! Okay, I'll calm down. Please be kind..ie: My HORRIBLE pictures, lighting and even worse cuticles. Anyway this is OPI - Done Out In Deco. This is one of my favorite purples....Although nothing will ever beat my China Glaze - Spontaneous.....If anyone has any suggestions or comments on my photos please let me know. I tried to take them 3 different ways. Done Out In Deco came out with the South Beach Collection in 2009. I only own 2 others from that collection, Clubbing Til Sunrise and Suzi & The Lifeguard. This shade is a creamy pale lilac color, it dries darker on the nails than what you see in the bottle. It has a blueish tint to it dry. Definitely a go to color in the spring. I love this polish that it fixes itself after applying it, it's almost like it smooths out into a flawless opaque layer. It is strange how every swatch I have ever seen of this color never truly shows the color that I'm seeing on my nails right now. All pictures are 2 coats; no top coat. I really hope that someone out there enjoys this, or even finds it helpful. I know that I search a million swatches of a color before I go and buy it. :) Thank you again if you came across my blog and took the time to read my posts. It's very appreciated.